More than two years ago the Marcellus Shale Coalition, a gas industry trade group, began building an electronic database to house information about the water quality in thousands of private wells across Pennsylvania. It’s made up of “pre-drill” or baseline data– critical information that helps establish whether drilling operations may have caused water contamination issues. The project is already up and running, but there are no plans to make it public. Instead, it’s available to gas companies, the state Department of Environmental Protection, and one researcher at Indiana University of Pennsylvania who has signed a confidentiality agreement. “This was designed from the very beginning to be a transparent process and to really raise the importance and profile of pre-drill data.” says MSC president Kathryn Klaber. But some scientists wish the process were more transparent. “I’m disappointed to hear the Marcellus Shale Coalition is not planning to release their data publicly,” says Dr. Susan Brantley, a professor of geosciences at Penn State University. The natural gas boom has helped shed light on the fact that Pennsylvania lacks standards for private water wells. A 2011 Penn State study found 40 percent of private wells across the state failed to meet federal safe drinking water standards before drilling occurred. The most common problem was coliform bacteria, but turbidity and manganese were also issues. Two years later, scientists say they’re still having trouble gaining access to some important information about water quality. Dr. Radisav Vidic chairs the department of civil and environmental engineering at the University of Pittsburgh. He’s the lead author of a new review for the journal Science, which highlights the need for more information when it comes to gas drilling and water. There is a substantial controversy whether the methane detected in private groundwater wells in the area where drilling for unconventional gas is ongoing was caused by well drilling or natural processes. 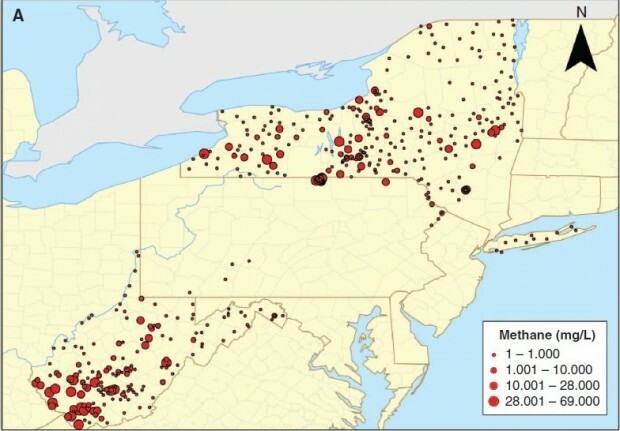 It is difficult to resolve this issue because many areas have long had sources of methane unrelated to hydraulic fracturing, and pre-drilling baseline data are often unavailable. There’s a big hole in the middle of Pennsylvania, Brantely explains, because there hasn’t been a study released with locations. She says its possible to make the data fuzzy so researchers can still use it (and map it) while preserving anonymity for homeowners. Confidentially agreements can prevent information about water wells from being released. It’s sensitive information that could harm property values and adversely impact homeowners. But Brantlely — who co-authored the Science review– says there are many ways to make the data “fuzzier” so researchers can use it and homeowners can remain anonymous. Klaber hopes the data will still be used for academic research. She says scientists from other institutions could partner with researchers at IUP who have agreed to confidentiality requirements. But Brantley says it’s becoming increasingly common for funding agencies and journals to request access to the raw data. She doubts she would collaborate on a paper without seeing the information for herself. Robert Wilson is the only person at IUP with administrative access to the database, and even his abilities are limited by the Marcellus Shale Coalition. Wilson heads the school’s Institute for Mine Mapping, Archival Procedures, and Safety. He says there are two parts to the database: internal and shared. About two dozen gas companies have already started uploading pre-drill testing results to their own internal section, where they can review the information, and then share it. The DEP can only access the shared portion of the database. The idea is to streamline permitting and skip the process of physically submitting information (usually .PDF documents on a DVD) to the agency. Wilson has already trained about 30 DEP employees on how to use the database. It’s unclear how this will impact record-keeping and Right To Know requests at the agency. A DEP spokesman declined StateImpact Pennsylvania’s request to discuss the database. Wilson assumes the DEP will download the information. At the same time the DEP appears to be making an agreement to use this industry-owned database, scientists are attempting to get the same information from the agency– in paper form. Susan Brantley says she’s working with the DEP on a memorandum of understanding to get access to the test results in order to put them on a public database. She says the DEP has been helpful, but given limits on staff and resources the process will take time.